MarvelNOW is in high gear and the a new status quo is exactly what this book needed. Time to revamp an already great book and make it better. One of the best things about Bendis’ “Avengers” run was the introduction of the Illuminati. A group of the foremost leaders of the Marvel Universe gathering to discuss how best to protect Earth. Iron Man, Mr. Fantastic, Black Bolt, Namor, Dr. Strange and Professor X. The first time they met the Black Panther rejected their invitation. 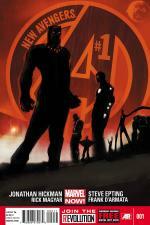 It’s a new Marvel U and a threat unlike others has emerged in Panther’s kingdom of Wakanda. He needs the Illuminati. With a few new additions. See that name on the cover? Jonathan Hickman? Yea, if his name is on something it must be read. After revolutionizing the “Fantastic Four” he’s been granted the keys to the kingdom with two of the three main “Avengers” books. The man is pure genius. Like, you’ll actually feel smarter having read a book by him. He changes the way books are done and read. He taking a perfect concept like the Illuminati and giving them their own title is exactly how you improve upon perfection. The Illuminati is made up of the smartest beings on Earth. To see what is in store of this high concept idea sends waves of anticipation through anyone who gives it a try. Must – resist the – urge! But oh the allure of the new comics! Of course I’ll have to check w/my accountant to see if I can pick up another new title.